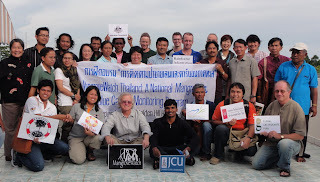 Thanks again for your enthusiastic participation in the MangroveWatch Workshop in Krabi. It was a great pleasure to meet a number of old friends again and make new contacts who are engaged in mangrove research and conservation. As I had mentioned at the workshop closing, the workshop is not the end, but was just the seed to start MangroveWatch - Thailand hub. In our program outline we had called our gathering a "training workshop", but in reality it was more of an "Introduction to Mangrove Watch". The next step for MangroveWatch - Thailand to become functional would involve the formation of local MangroveWatch hubs, consisting of community representatives, government agencies, NGO’s and community coordinating groups and scientists from local research institutes. Additionally, local scientists would require in-depth training on data collection using videography and the analysis of data at the proposed hubs. During the final group discussion there appeared to be a consensus and real interest in the formation of Mangrove Watch Hub, on the both the Eastern seaboard of the Gulf of Thailand, and in the South on the Andaman Sea coast. This sentiment was echoed at an IUCN BCR workshop in Chantaburi, attended by Norm and Jock following the Krabi workshop. The immediate next step would be to secure funding so that a MW Training Workshop for community members and NGOs involved in data collection and could take place in early 2012 at the earliest, with trainers from MW Australia coming to Thailand to lead this event. IUCN has committed to a follow-up workshop led by Dr Norm in Duke, for potential science hub members in conjunction with coastal week, early December 2011. We were very pleased to observe lots of informal networking occurring amongst participants at the workshop, so we're happy to attach the workshop participant contact list so that momentum of information exchange can continue. A MW workshop report will be produced in both Thai and English and will be sent out to all of you when it's ready. I can't get over just how lucky we were with the weather during the workshop, as it rained all day and night on the 9th, 10th & 11th. Serious flooding is now in many areas of the country at the moment.